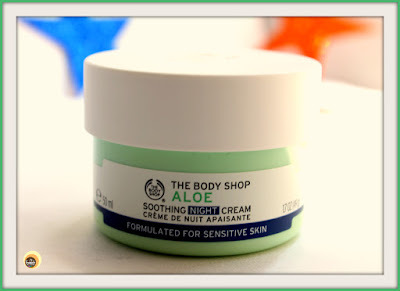 Today I am reviewing Aloe Soothing Night Cream from the Aloe-range of the brand The Body Shop. The product claims to soothe and restore the skin’s moisture overnight, but is it the best night moisturizer for people with sensitive skin? To know more about it, keep scrolling down! The Body Shop Aloe Soothing Night Cream comes in a light green coloured, 50 ml plastic tub packaging with a white top lid. 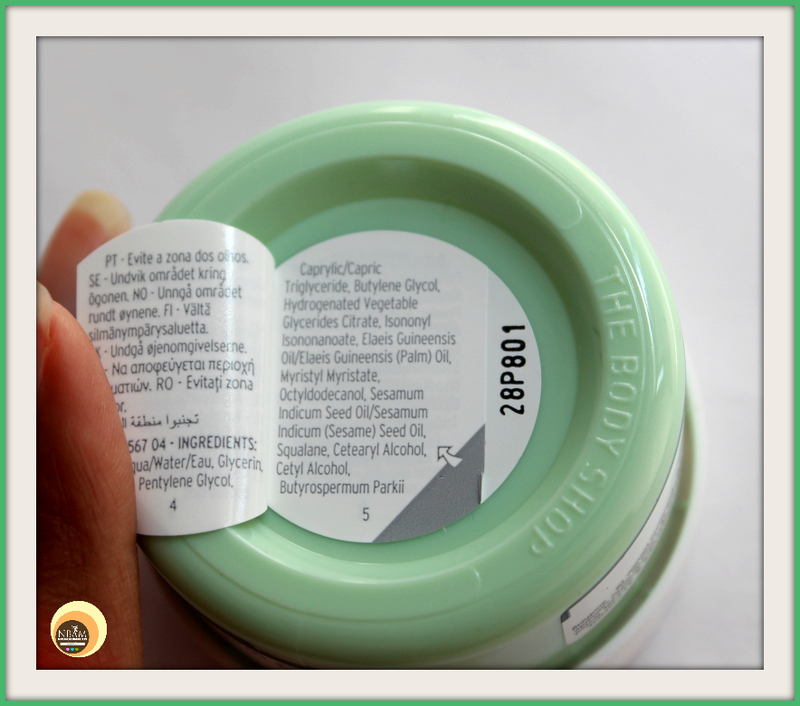 You can find the product related information on the back of the packaging and it’s travel-friendly also. The ingredient list is mentioned at the bottom of the packaging. TBS Aloe Soothing Night Cream is white in colour and has a rich creamy texture. The consistency is neither thick nor thin, it’s smooth. It has no fragrance! I used to take a dime sized amount of this soothing night cream and apply all across my face & neck. The texture feels a bit heavy whilst application and also leaves behind a greasy effect on the surface of the skin. 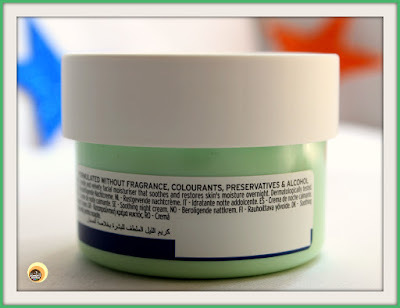 If you don’t like night moisturizers that imparts oiliness, then this one is not meant for you, definitely!! Owing to its moisturizing properties, this aloe soothing night cream makes for a great moisturizer for dry to combination skin. It’s also the perfect moisturizer for the cold seasons when our skin tends to lack hydration, becomes dull & parched. I loved its nourishing & soothing effect which would make my skin soft and supple. The side-effect of sleeping in a cool, air-conditioned room is that it dries out the skin if not taken care of! But thanks to this aloe night cream, every morning I woke up with a plumped and glowing skin. It never caused any skin irritation or breakouts, thanks to its alcohol, preservatives, colourants free composition. However, it couldn’t reduce the existing acne scars or blemishes, neither has it claimed so! 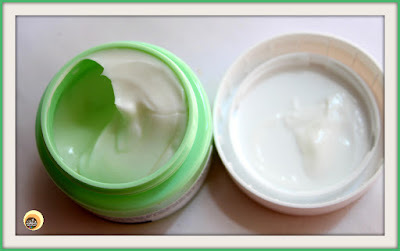 Nevertheless, I completely avoided this cream when the weather was too hot & humid or when the skin went on strike mode. Simple Aloe Vera gel comes to my skin’s rescue at that time. On other days, especially in winter, I found this aloe soothing night cream as my skin’s saviour. A little goes a long way so the product will last long! It feels a bit heavy/greasy post usage! Has tub packaging so you need to dip your fingers to take out the product! Sounds unhygienic, right? Not suitable for oily skin especially in the summer season! The Body Shop Aloe Soothing Night Cream is an effective night cream that calms, hydrates and soothes your skin. It is a gentle and non-irritating moisturizer, so perfect for sensitive skin types. 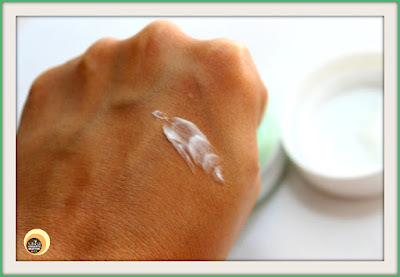 I wouldn’t say this night cream is a must-have product but if you are not allergic to aloe or any other listed ingredients and are on the lookout for a hydrating night moisturizer for your sensitive skin then you must give this product a shot. Great for dry to combination, acne-prone, sensitive skin types! 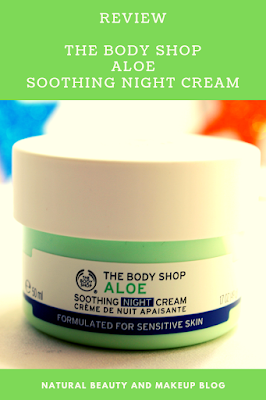 Have You Ever Tried The Body Shop Aloe Soothing Night Cream? If Yes, Please Share Your Experience With Us In The Comment Section below. This is a great review! 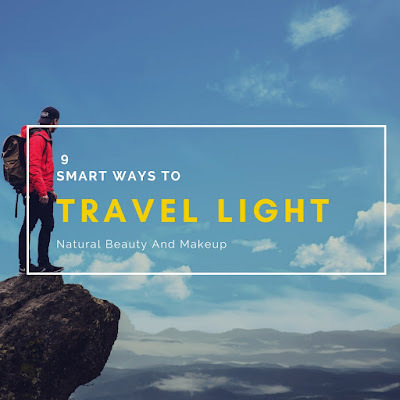 I feel like I always have to do a switch of beauty products from summer to winter and winter to summer. Lightweight is always key for me when it comes to a cream. I love that it has no added fragrance either! I simply use oils on my face for moisturizer. Almond oil has been my go to as of late and it's awesome! This looks like it would be great to help with sunburn! This sounds like a wonderful cream to try. Thanks for posting the ingredients list! Oh this sounds great, my skin is so sensitive so I have to be careful with what I use all the time. My younger daughter skin is so sensitive. I am going to give this a try. I need to try this moisturizer I have such dry skin. I also dont have a night moisturizer I love yet. Wow what a great review I mean it's so well detailed that I can figure out the cream. I would love to try this out. You had me at sensitive skin! I’m a huge fan of the body shop! This is such an awesome looking cream. I also am not a fan of the creams in the tubs but I use a wooden spoon to get my creams and other things out that come packaged like this. Thank you so much. This is just the information I needed. Thank you for sharing. I was planning to pick this up due to sensitive skin suitable claim but now i think for summer this might not be a good idea, probably best to pick up in next winters..